Southern Illinois University Edwardsville and Southwestern Illinois College (SWIC) have established a reverse transfer agreement. The Reverse Transfer Credit Program adds a new student-centered feature to the institutions’ existing partnership. The program allows students who have transferred from SWIC to SIUE, without having completed their associate degree, an opportunity to transfer credits back to SWIC in order to obtain this initial credential. The program helps SWIC document degree completions at the community college level and assists the student in adding a higher education credential. Upon SWIC awarding a student their associate’s, SIUE will waive their general education requirements. To be eligible for the program, currently enrolled SIUE students, who transferred from SWIC prior to receiving their associate degree, must have a minimum of 36 credit hours from SWIC and have completed one semester at SIUE with at least a 2.0 GPA. These students will be identified and encouraged to opt into the Reverse Transfer Credit Program. SIUE will then transfer their University credit to SWIC, at no cost to the student, to determine if the courses will satisfy the remaining requirements for completion of an associate’s. SIUE’s Reverse Transfer Credit Program with SWIC took effect in August. Qualifying students will be contacted via email. For more information, visit siue.edu/transfer/programs. 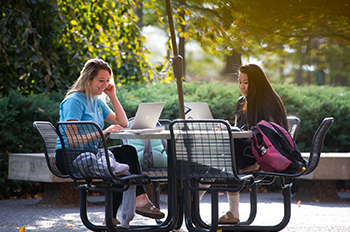 Photo: Students study outdoors on SIUE’s campus.